The meeting was organized by the Batticaloa Development Committee at the Government Teachers’ Training College in the eastern town. Muslim and Tamil businessmen of Batticaloa town, representatives of the Kattaankudy Traders’ Association and local Mosque Trustee Boards and several civil society leaders from both communities took part in the meeting. The President of the Batticaloa Development Committee, Mr. K. Ganesh said that the shut down (Hartal) in the Muslim towns was organized without prior warning and hence Tamils were unaware of it. He said that the Tamil people would have cooperated with the Muslims if they were informed on time. (L-R) Batticaloa Development Committee Chairman, Mr.K. 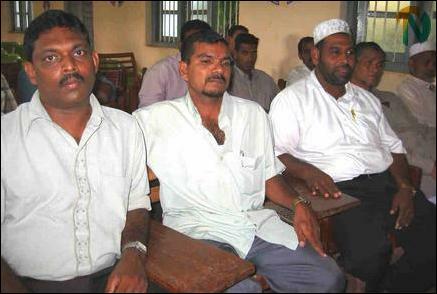 Ganesh, the town's political division head of the LTTE, Mr. Senathirajah, and Poet Mr. Shanthi Mohideen. “The stone throwing was a deliberate act meant to provoke a backlash”, he said. 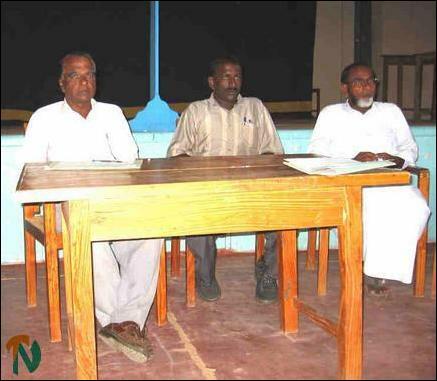 Responding to the observation of Mr. Ganesh and other Tamil representatives, the Muslim community leaders said they too were unaware of the group that called for the shut down in Muslim towns in the Batticaloa- Amparai districts. “We deplore the stoning incident. The people of Kattaankudy are not responsible for it. We have discovered that a third party had come into our town to create mischief”, the Muslim community leaders said. They said they would pay for the damages of the vehicles which were stoned in Kattaankudy on Thursday. “Both sides will lose if we, Tamils and Muslims, do not live in harmony. We should not allow third parties to come between us”, Mr. Senathirajah said, concluding the meeting.